And yet, from this laconic beginning, an extensive mythology has grown, which has inspired many artists, from the eighth century to the present day. This study explores the various narratives and their influence on art. One small, sad footnote: I am writing this in June 2011. 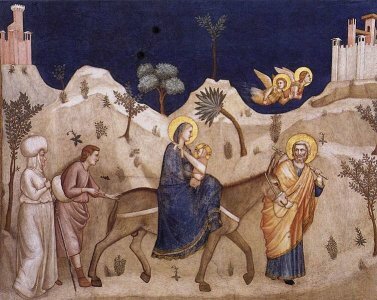 A Google search of the words 'Flight into Egypt' brings reports of families fleeing into Egypt with their children from an unforgiving dictator in Libya. An ancient story suddenly takes on a very modern resonance. Spot the Holy Family - if you can! Case study- Caravaggio - Rest on the Flight into Egypt.